American Group awards Estes Express their Partner Carrier of the Year award for 2018. 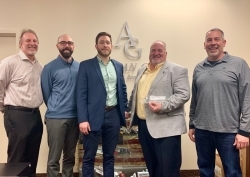 Phoenix, AZ, March 05, 2019 --(PR.com)-- American Group awarded their 2018 Partner Carrier of the Year award to Estes Express, based in Richmond, VA. The award is based on several key performance indicators, including On Time Service, Invoicing Accuracy, Low Claims Ratio, Ease of Doing Business, and Service Offering options. Accepting the award on behalf of Estes Express is Jeff Lee, National Account Manager (3PLs) and Peter Cloutier, 3PL Pricing Analyst. Michael Schember (CEO) and Daniel Krivickas, Jr. (President) presented the award on behalf of American Group. "Estes Express has been a fantastic partner carrier for American Group for almost a decade now. Their customer-focused approach, combined with their LTL expertise and ease of doing business, made them a natural choice for this award," stated Daniel. "American Group's trademarked tagline is Shipping.Simplified., and Estes Express truly makes it easier for us to deliver on that pledge to our clients." Founded in 2006, American Group is based in Chandler, AZ and is the 2nd largest privately held 3PL in Arizona.